Festivals have always been the reason of happiness & bond-factor in India & Durga Puja / Navratri is one of them. It is celebrated to worship Hindu goddess, Durga. The term Navratri, literally means the ‘nine nights’ in Sanskrit and the celebration continues for the nine days. It is celebrated with great zeal, passion, and enthusiasm in many ways by many people of the country. Though the ways of celebrations are different the most common thing is the tradition of exchanging gifts. The first three days of the Navratri festival are related to worship of Goddess Durga Devi. Then the next three days are related to the worship of Goddess Laxmi and the last three days worship of Goddess Saraswathi is done with all rituals. Some people keep fast on all the nine days while consuming food only once a day, While some people take only fruits and water and even avoid a single morsel. Navratri festival is celebrated all over the country but with the different names. North Indians celebrate Navratri by worshipping the idols of Goddess Durga. They are offered with delicious food items and gifts. In Bengal, decorative ‘pandals’ are made and people will visit these ceremonial pandals to worship Goddess in the festive mood. In Gujarat, the nine nights of the Navaratri are celebrated with traditional local touch which has now become global. A traditional dance form ‘garba’ is performed throughout the nine nights of celebration. Similarly, Navratri is a time when many homes in southern states of India—parts of Tamil Nadu, Karnataka, Andhra Pradesh, and Kerala—feast on colors, music, light, and food. Visitors are greeted with gleaming dolls, Golu is the artistic display of dolls on the numbered tiers or steps, usually made of wood/steel. The nine steps represent the nine days of Navratri. Traditionally, few top steps include idols of gods and a Kalash (Mangal Kalash/Kalasam) with fresh water, covered with the coconut and mango leaves. The next few steps will have idols of heroes and saints of the country. Another few steps represents human activities, depicting functions such as temples, marriage, and a music band or orchestra. Business is usually represented by the Chettiar(Doll) set of dolls, with the shop items and wooden dolls which is called as Marapachi dressed withcolorful clothes. Today, Golu has a thematic representation of ancient stories, depicting the scenes from Bhagavad Gita and, Ramayana among others. It is a custom to add a few new dolls in every year. 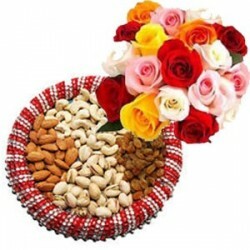 Navratri is made remarkable with exchanging gifts. Along by merrymaking and feasting, people convey wishes and their happiness by sharing wonderful gifts with their close ones. 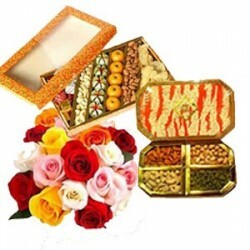 You can celebrate this auspicious occasion by pampering your dear ones with Navratri gifts. 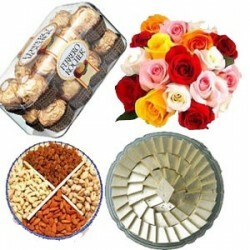 Exchanging Gifts have become a common trend among people which will bring an enchanting atmosphere into their life filling the heart with immense joy. The perfect Navratri Gifts can be ordering, Goddess Laxmi, Goddess Saraswathi,Lord Ganesh, Lord Krishna, Mangal Kalash, Goddess Durga idol online, it much appreciated during Navratri – which are said to bring good luck. Spiritual gifts bring peace and happiness in times of need. 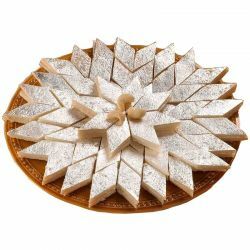 Indian festival will not complete without sweets and they make one of the best gift ideas. sharing sweets on any Indian festival is always considered auspicious. People usually exchange sweets to convey good happiness and luck to their loved ones. 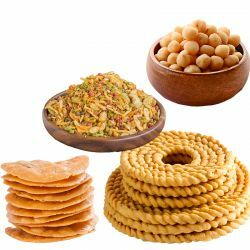 Thus, you can enthrall your dear ones on Navratri by sending mouth-watering Navratri sweets online. 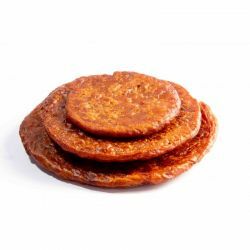 People all over the world are very fond of Indian sweets for their rich taste and flavor. There are a lot of delicious sweets available on OYC. Some of them are Motichoor laddoo, Kaju Pista Barfi, Kesar Peda, Rasgulla, gulab jamun, Sohan Papdi, Kaju Pista roll, chocolate barfi, sugar-free sweets and a lot more. Worshipping Goddess Durga Mata is the most prominent elements of Navratri festival. Thus Navratri thali reflects as the best gifting option. 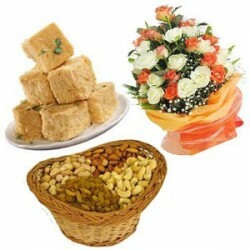 A bouquet of flowers makes one of the most affordable and yet thoughtful Navratri gifts . Surprise your loved ones with an attractive bouquet of the most colorful flowers on this Navratri. Durga pooja flowers are very good at expressing your innermost feelings to the people you care about. Chocolates always make children happy to no end, ordering a gift packet filled with the assortment of chocolates would be an ideal gift for them. Also, you can also buy some traditional Indian garment to add a splash for their celebration. The Navratri accessories can range from traditional items to modern fashion accessories. There is a wide spectrum of choices at OYC including utensils, belts, bags, brooches shoes and puja items. A traditional saree is another beautiful Navratri gifts item for all women. A traditional sarees can make the woman look stunning and get her decked up for the Navratri celebrations. Just like there are plenty of gifts items for women, there are lots of Navratri gifts items for men as well. You can pick the traditional ethnic wear such as Dhoti kurta, Pajama kurta or a shawl with fine embroidery. Golu dolls will be the perfect Navratri gift, as Navratri Golu is special at every house. Can you deliver sweets and Idols as Navratri Gifts to Bangalore? Yes, can deliver sweets and idols for Navratri in Bangalore. We have service all over India. I need some traditional Bengali sweets for Durga Puja celebrations in Durgapur. Can you deliver there? 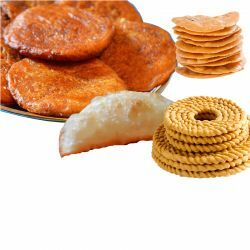 Yes, we have lot of traditional Bengali sweets in our online sweet shop which includes Rasgulla, Rajbhog, Cham Cham, Dodha Burfi, Besan laddu and more. 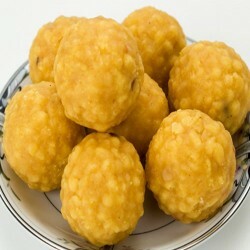 We can deliver sweets to Durgapur. Bought this amazing Navratri Hamper and sent it to my relatives. It was very great navaratri hamper thank you. Bought Colorful Navratri combo from Oyc. The flowers was so fresh and sweets was delicious. Thanks a lot for making our festival special.